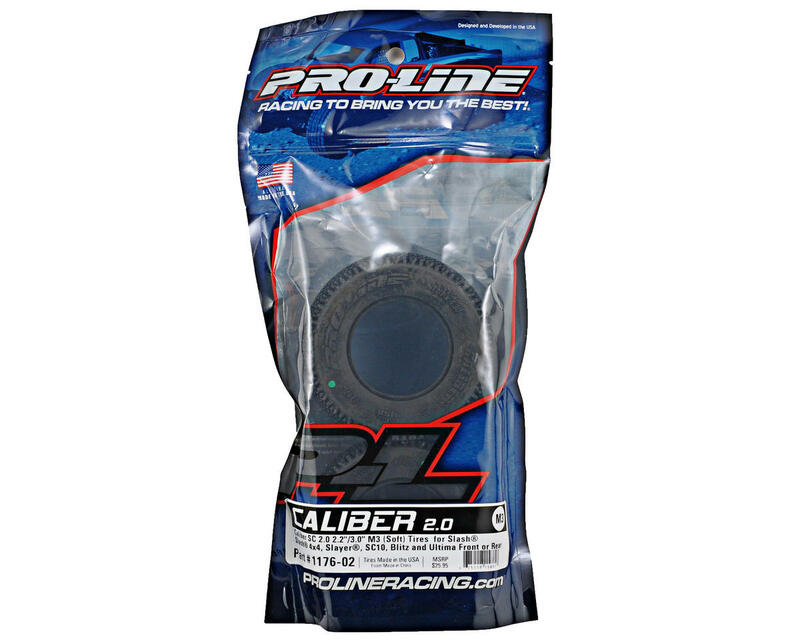 This is a set of two Caliber 2.0 SC 2.2”/3.0” Tires. Short course trucks have become class leaders at tracks around the nation because it’s fun and there’s a class for everyone. For those of you that want the most out of your short course truck, the Caliber 2.0 is ready for you to leave stock in the dirt. The Caliber 2.0 SC takes tire technology to the next level by optimizing traction, control, balance, and tire wear with its dual-stage design and wider contact patch. The smaller top pin penetrates through loose dirt while delivering unbelievable side and forward bite. The base pin works as a support for the top pin while acting as a dual-stage design once the top pin is worn down. You can rely on the base pin for greater tread life wear and it works well on those tracks that are prone to blue-groove or have a super clean surface. Good for dry hardpack dusty conditions. I run them on the rear of my 2wd Blitz with Blockades up front. Excellent tire for dry tracks really hard with the dusty surface, my Losi Scte 2.0 and my Traxxas Slash 2wd to are equipped, I love. Bought these tires for my new protrac beadlocks. Fit perfect and look amazing. M3 is really soft and when cleaned with Simple Green, stick to each other like glue! I got these for my Slash 4x4 LCG for a race weekend. Track was a hard packed, almost blue grooved GA red clay. Tires were great when the ground was a little damp, but when it baked in the sun for a couple hours, the tires got a little squirrelly. Wanted to spin out if you didn't control it well. After 1 practice night, a day of 3 qaulifyers, and 1 A-main, the top layer of pins wore off. My brother ordered blockades for the same race, ans they appeared better for a dusty track. Great tires if you use them on the right surface. 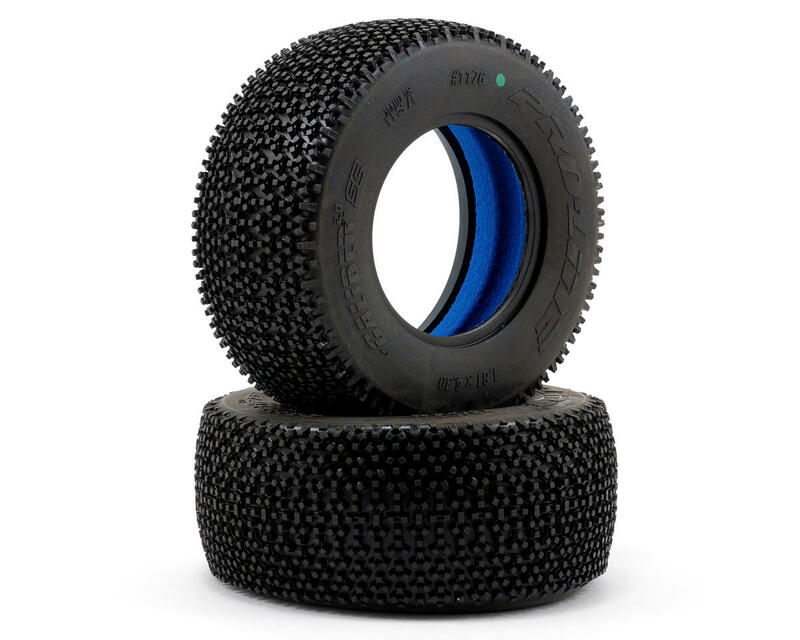 Mounted on my short course truck these tires are great in loose dirt loam track. Awesome tires, even with the medium compound they gripped great onroad, dirt, and even some sand type surfaces. Mounting is super easy and there hasn't been much ware. If you are looking for a good traction high quality bashing tire, these are the ones to get! I ran these on the rear of my Slash 2wd which I race at an indoor carpet track. I can't say anything about other surfaces, but they're great on carpet. They've got great forward bite and just the right amount of lateral grip. They're not as good once they wear down to the base layer, but it's taken nearly 3 months of weekly racing for them to wear down that far.